Another house I invaded in pursuit of learning all I could about Swabian Maultaschen belonged to my friend Petra. She and I became friends through Spielgruppe (Playgroup) for our first-borns: our first daughters are 6-months apart and our second-borns are one month apart. To top things off, after two girls each, our youngest children are both boys. Petra very kindly opened her home to me and invited her friend, Katja who is a trained cook and foodie for an evening of Maultaschen how-to. and the third was meant to be a multi-grain variation, but Katja had recently discovered the vegan diet (hurrah!) 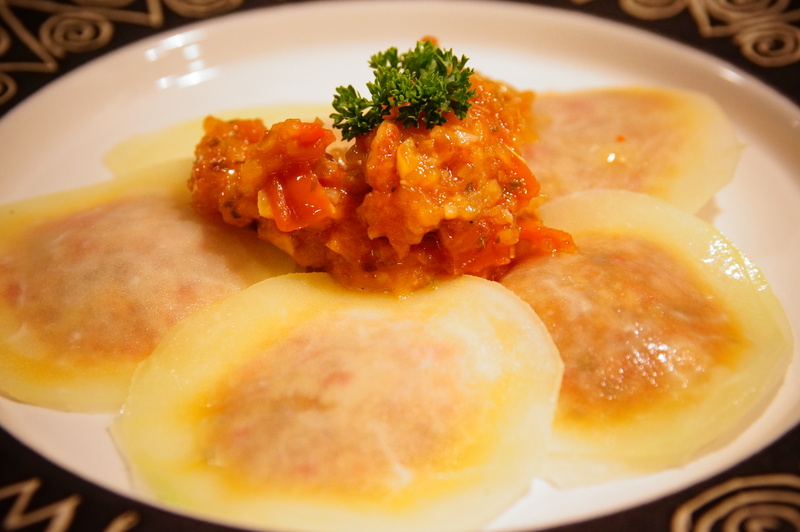 and was following the Vegan for Fit cookbook program, a popular cookbook which has been converting many to the vegan diet in Germany, that she decided to try a Kohlrabi ravioli recipe instead. Combine all ingredients and knead into a smooth dough. As in the traditional (meat) version, you have to initially move quickly to avoid lumps. Wrap in clear plastic wrap or place in a covered container to rest for one hour. Place the spinach, parsley and chopped bread in a blender and mix. In some olive oil, sauté the spring onions with garlic. Combine the contents of the blender with those of the fry pan and mix everything together with the cheese and eggs and season with salt and pepper and nutmeg to create a creamy green flecked mixture. The mixture was a bit wet so she added some dry bread crumbs. Petra uses a pasta machine to roll out her dough. So she spread these sheets out and a bit of a “Maultaschen roll off” ensued as Petra demonstrated how she assembles her Maultaschen: she spreads out her filing on most of the surface area of the dough like Frau Deibler does in the traditional version. She does this in 6-8 inch stretches of dough and then rolls everything shut to create a little parcel of Swabian vegetarian stuffed dumpling joy. She makes it all pretty by using the tines of a fork to create creases on the edges. 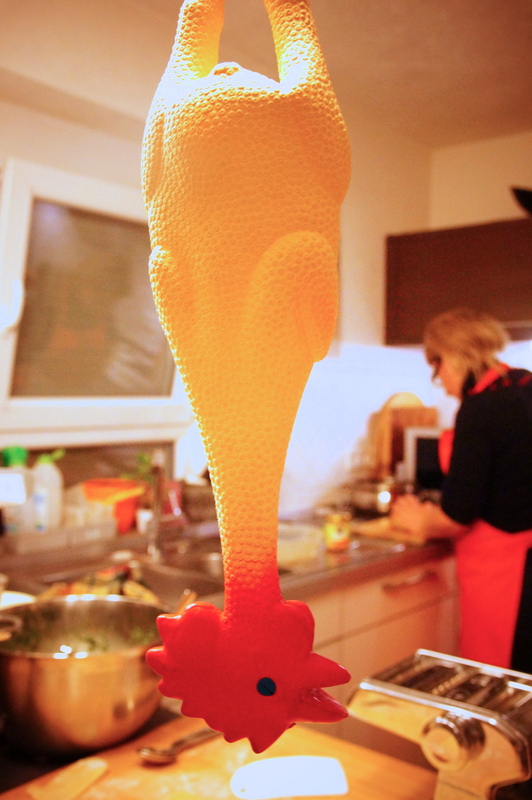 Then Katja showed us how she typically makes her Suppen Maultaschen (Maultaschen for soup). It was more of a ravioli style. She put small blobs of filling in regular intervals on a long stretch of rolled out pasta dough. She brushes the edges with a pastry brush and egg white and gently rolls everything shut by folding the dough over from one short end to the other. She then divided each Maultaschen by pressing down the edges from each side and used a knife to cut them, creating mini little Maultaschen that looked like little ravioli. 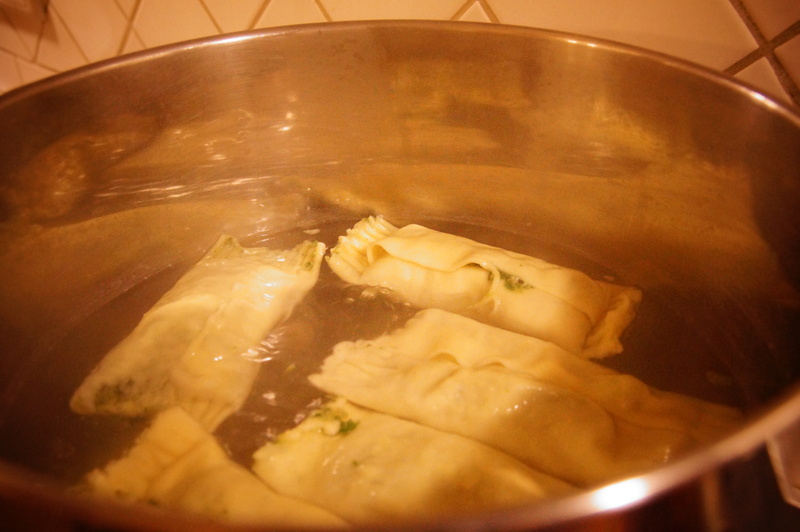 Meanwhile a big pot of water was boiling and we cooked the Maultaschen for 20 minutes. Sauté the chopped onion in a tablespoon of olive oil and add the chopped chilis till the onions are glassy. Add tofu and add in turmeric and cumin powder, salt and sugar. Gently saute till all spices are integrated, about 6 minutes. Meanwhile place the coriander (or cilantro) leaves, chick peas and contents from the fry pan in the blender and mix. Once you get a nice, creamy mixture, you can roll out more dough and spread out the filling as described above. Cook in boiling water as well till they float to the top. And here are how both of these vegetarian Maultaschen varieties were served by Petra. Tada! As for the final version which Katja made, I am only going to describe the ingredients and what Katja did since I do not have permission to reprint the recipe here. As I mentioned earlier, it is a recipe published in the Vegan for Fit cookbook by Attila Hildmann. Katja used the mandolin to shave the Kohlrabi, which was used as the pocket or dough for her Maultaschen/ravioli. I will tell you that it was so fresh and crispy. We snacked on these while she put everything together. What a delightful surprise: there was something so refreshing and juicy in biting into these paper thin wafers, especially when you think that these are a winter vegetable. She wilted them in olive oil and salt which allowed the two slices to stick together. The filling consisted of finely chopped red pepper and onion that is gently fried in olive oil. Now the secret weapon: this is an example of transforming an ordinary ingredient into a culinary wonder. The recipe calls for cashew cream, but she only had peanut butter on hand. The red pepper and onion mixture along with some salt, pepper and dried oregano were mixed with the peanut better. Katja had the presence of mind to add some chili to add some heat, and we couldn’t get enough. She placed this surprising creamy and lively mixture between the kohlrabi sheets and pressed them gently together. With some extra filling drizzled over as a sauce, we were practically licking the plate. Needless to say, there were none of these leftover to take home. For the precise recipe, check out the Vegan for Fit book! Kiss this cook! Here’s Katja enjoying the fruits of her labor. 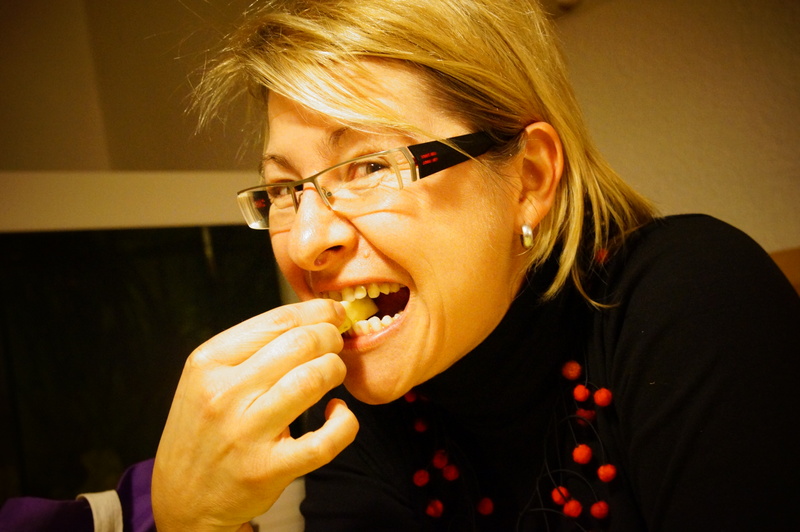 Tausend Dank, Katja and Petra for sharing some more Swabian Maultaschen techniques and for the fun evening! Tags: Aalen, asian vegetarian Maultaschen, asiatische vegetarische Maultaschen, attila hildmann, attila hildmann rezept auf englisch, cooking Korean in Germany, Jane, Kohrabi ravioli, Maultaschen, Maultaschen recipe, ravioli, Schwabenland, Swabian food, vegan, vegan for fit, vegetarian, vegetarian Maultaschen, vegetarische Maultaschen. Bookmark the permalink. Made the veggie version tonight with whole wheat flour. I didn’t have a pasta maker so I wasn’t able to get the pasta thin enough but it was still good! Do you have any idea what the nutrition facts would be for one piece?? I’m so pleased that you tried this, Megan! (Apologies for not responding sooner. The notice ended up in my Spam.) I have no idea about the nutritional facts. I don’t have a pasta maker either and have also rely on elbow grease!